Completed [World Event] Happy 4th Birthday! Discussion in 'Completed World Events' started by Zelda, Mar 5, 2016. March 9th is our birthday, so join us for the rest of the month for birthday fun! We've been a family for 4 years now, it's time to put on your party pants and celebrate! Astaroth has been evicted and instead a Giant Birthday Cake has taken his place. Gather up a set of erasers and head over to Charles to summon a Cake to celebrate our 4th anniversary! The grand prize has been updated. 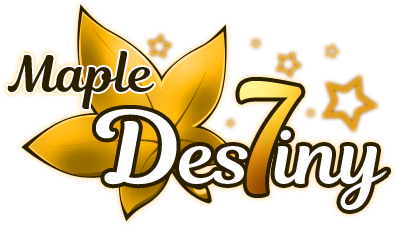 Mini bosses are spawning all around the world in Maple Destiny! Hunt them and collect Birthday Presents to exchange for prizes. Exclusive rare NX items and chairs can be earned from Birthday presents. If you're lucky you might get some Birthday Cake! Don't accidentally eat it though! Birthday Cake can be exchanged with our event NPC Cake Gift Box in Henesys for exclusive Anniversary equipment. Unfortunately after a month of trial, our intern program wasn't working out the way we had hoped. We have decided to close our Intern program. Due to time conflicts, Manipulative will no longer be able to assist staff. Please welcome our newest staff member Vigor!